Being a guy, I'm not a HUGH fan of Valentine's Day, but after my Girlfriend saw this photo (that I more or less just snapped on a whim), see convinced me to play around a little with it. After messing around with it a little, I came to this conclusion and thought I'd share with my fellow Pentaxians. Enjoy! cool! this is one of those photos that once you start working on it you can't stop... I love your rendition, it turned out very nice. Are the large hearts red as well? And I am wondering what colour the designs on them might be? The large in the middle, is there any colour in that design that you can add subtly to the image? Or, maybe the bokeh I think I can see in the very background has some colour in it... Just thinking a dash of subtle colour elsewhere in the photo might add some more visual interest to the whole. Geesh, just realized this is not in the critique forum. Hope you don't mind ... my suggestions are just that, coming from someone who also likes to play around with the post processing. It is a great way to learn new techniques. I think the photo as is is very creative. Cool shot. This could be on a valentine card (someone call Hallmark.) Usually not a fan of selective coloring but I think it works here. Thanks slowpez, I actually turned this into a Valentine's Day gift for my Girlfriend and she loved it, lol. tessfully, I more than welcome your critique...I can't learn without some criticism. 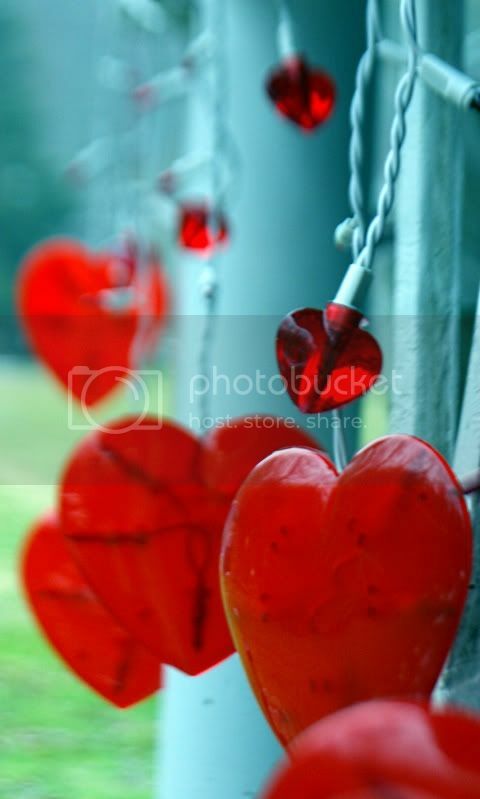 Here's the original picture, the bigger hearts are also red and the design you might see in them are actually lights that splay out from the center of each heart. I think I may mess with the photo a little more and try some of the tips you suggested.